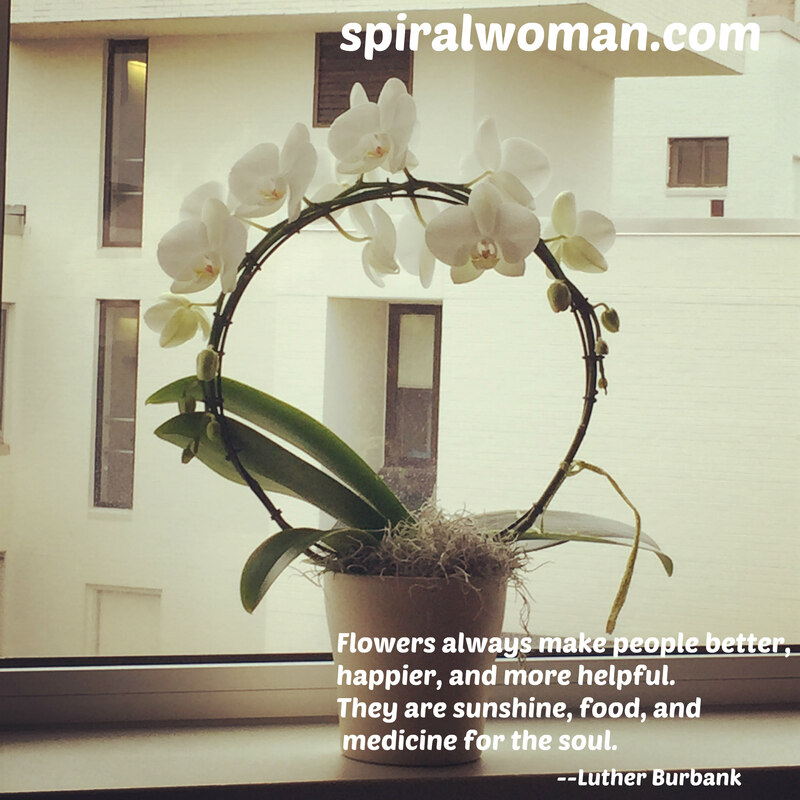 View out my hospital room through the circle of orchid sent by a dear friend to heal me. A few weeks ago, I “felt off” one evening. My daughter and I were watching a hilarious feel-good movie on Netflix. An hour of not very feel-good discomfort later, the movie was over, and I said, “Worst gas pains ever. Can you clean up the dinner dishes?” Twenty minutes after that, I was having a hard time coping with the pain in my abdomen. I was breathing (sort of) through it, only the pains did not come in waves, like labor. It was just one looong wave… of horrid. Then the vomiting began. The backdrop to this was my daughter being “on it” and texting with one of my best friends, Ann, who happens to be a nurse practitioner and our “go to” for the Western medicine perspective. The two of them were pretty much trying to find a “when to go to the ER” solution I’d abide by. Why was this a struggle? I was sure it was “nothing.” Looking back, even if it hadn’t been appendicitis – which, yup, it was—it was something damned awful. When the uncontrollable shakes and shivers began, I even had a way of explaining that from a medical felony down to a mere misdemeanor. My blurry and haphazard thoughts also included growing anxiety because I was not “coping” all that well and part of me just did not want to have to make this seemingly overwhelming decision. Had our positions been reversed, I, the mother, would simply have put my foot down. But even a fully functioning adult daughter who is used to her mom making all her own decisions did not feel quite comfortable bossing me around. I’ll ask for a raise. I’ll stake my claim in a debate about politics, ethics, parenting, climate change, organic food, you name it. I’ll speak up to strangers behaving like bullies in public. I’ll insist (of myself) that I go to the gym, eat right, and get regular check-ups. Had Maggie not been there, I don’t know if I would ever have made the decision to call 911. But she was there. But what if she hadn’t been? But she was, okay, but … what if she hadn’t been? Lesson learned. Having been schooled (kindly but sternly) by the ER docs and nurses and (very charmingly) by my surgeon, my own misguided idiocy has been made crystal clear to me. All went well. I meekly obeyed all post-surgical commandments and have healed flawlessly. Life goes on in all its beauty and I have felt no resentment, annoyance, or even a whiff of huffiness in response to my encounter with the vestigial enemy within. Only gratitude. SUPER flattering photo taken by my daughter a few hours after my surgery with her little caption. She was impressed by my hanging fluids, apparently. I guess considering I’d just had surgery I don’t look TOO bad…. 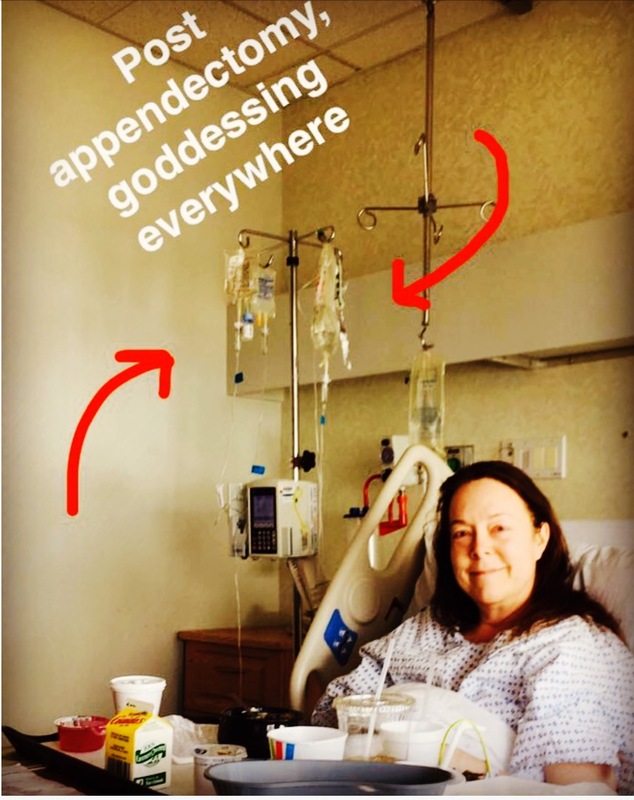 This entry was posted in body, mind, soul, Uncategorized and tagged appendectomy, appendicitis, Gratitude, self care. Bookmark the permalink.